Ana Bon-Bon's Sundays for Sinners showcase returns monthly to the historic Princeton Pub & Grill in Vancouver's east van brewing district! Swingin' country blues trio featuring Mike Kenney (guitar) and Taylor Little (drums) with Ana Bon-Bon leading the revelry on rhythm accordion and vocals. 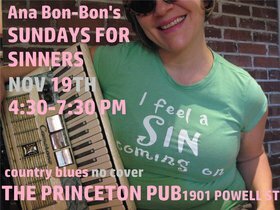 Come join us for a great musical afternoon with rotating craft brews, pool table, views of the trains, and very friendly people in the warm and relaxing Princeton Pub! free entry, no minors. Music from 4:30 pm-7:30 pm Sun. Nov 19th, 1901 Powell St, Vancouver BC.